Just the name Sequoia is synonymous with powerful and strong. It is no coincidence that Toyota named their rugged SUV with the same word. Now, the 2018 Toyota Sequoia has been given even more muscle with the addition of a package designed by the Toyota Racing Development team. Toyota gave the 2018 Sequoia a new trim level by adding the TRD Sport grade to the lineup. This means you can take your adventure off road by choosing the 4WD configuration. The Sport is equipped with a tough 5.7-litre V8 iForce engine with 381 horses and 401 lb-ft of torque for powering through streams and up mountainsides. It comes equipped with Sport-tuned Bilstein shocks that work with front and rear sway bars to reduce roll in order to keep the interior ride comfortable even when the road is rough. Toyota planted the TRD Sport on a set of 20-inch wheels and rims that enhance its rugged stance. It comes with either a Double Cab or a CrewMax body. The new TRD Sport package is designed to get you to the most remote lakes for fishing and the highest spots for skiing. It is built for outdoor fun, and as the weather starts to get nicer, you can start planning your summer excursions. It is available in three colours and comes TRD sport badged. 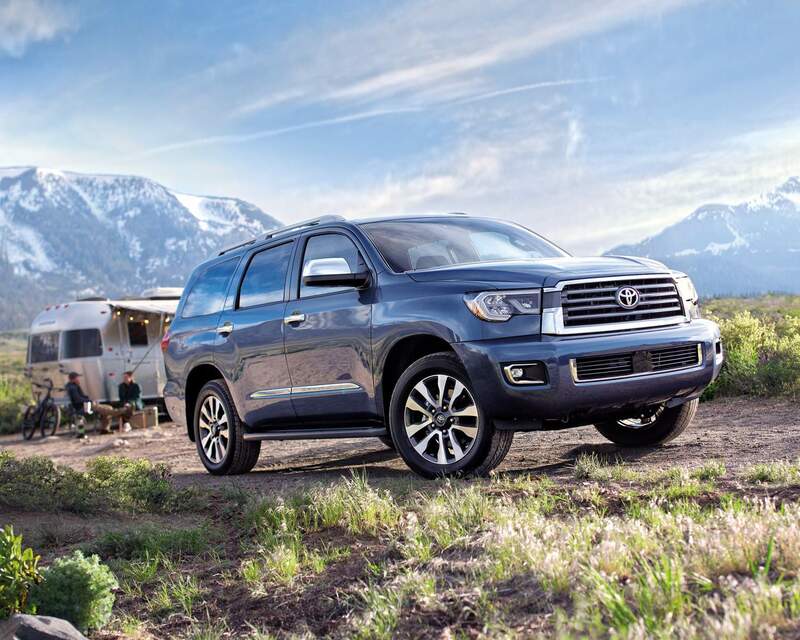 For 2018, the Toyota Sequoia is given a slight makeover with the addition of LED headlights and fog lights as part of the standard equipment and a reshaped grille along with trim specific inserts. The trim packages stay the same, but there are new colours on the horizon. In addition to the sprucing up of the face, Toyota did a little revamping to the dash, as well. There is a new gauge cluster and the infotainment display has been revised. If you wanted extra storage, then you’re going to like the new centre console that offers plenty of storage room that wasn’t there before. In order to keep the Sequoia equally equipped with all the other Toyotas, the Toyota Safety Sense-P suite is now standard on this SUV. That means it comes with lane departure alert, adaptive cruise control, automatic high beams and pedestrian detection across the trim lines. You still get the same efficient V8 5.7-litre iForce engine and a choice between rear-wheel-drive and four-wheel-drive. There has been no change in the 6-speed automatic transmission, either. Other than the TRD Sport package availability, both years are equally capable of taking you to your favourite fishing hole or ski lodge. The interior is spacious with room for everyone. The 7-passenger models offer a middle row with heated and reclining captain’s chairs for comfort on long trips and warmth during the winter. 10-way power driver’s seat adjustments let you find the perfect combination for distance driving. A power fold-flat third row seat is also available. The Platinum model offers leather seats and a rear DVD system with 9-inch screens. This is a road-ready vehicle that makes travelling fun for everyone. The Sequoia comes in three models, and all models come standard with 3-zone independent climate control, stereo system with integrated SiriusXM and auxiliary jacks. Heated front seats are also standard across the models. Either the 2017 or 2018 Toyota Sequoia is sure to impress, so stop by and see all of the features on this rugged SUV. Come test drive the Toyota Sequoia today.